On the positive side, smartphone ownership for older adults is up. You have seen older people with their smartphones – they’re in concert halls and restaurants staring at their screens, fascinated -- scrolling through emails, studying photos, watching videos, seated next to other 80-somethings, who might be envious, texting on their very, uh, compact feature phones. Says Pew Research of their 2016 survey data: 42% of the 65+ population have smartphones. Not surprisingly, only 7% of that population fit the Pew definition of smartphone dependent -- that is 'reliant on their smartphone for Internet access.' Juxtaposed with Pew’s tracked history of Internet access over 15 years, for the 65+ population, as of 2016, 64% of these smartphone owners are users of the Internet. 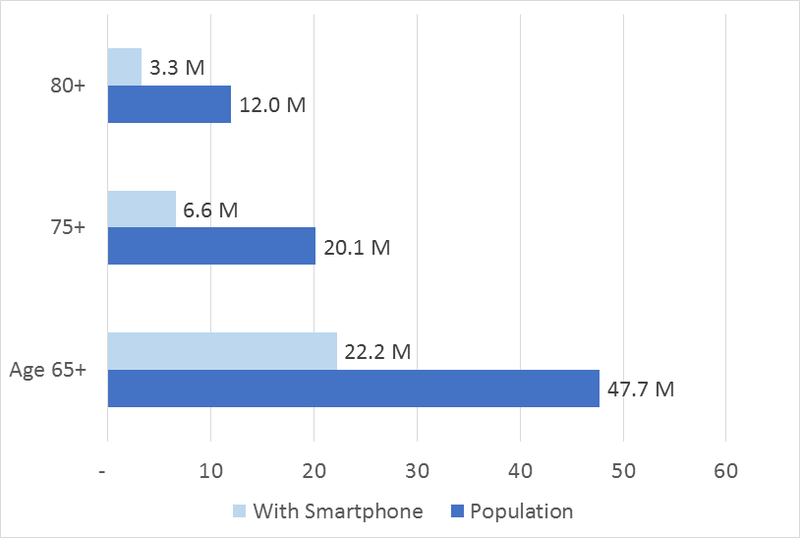 There’s more to this smartphone ownership story – and it is in the US Census. Pew is an excellent benchmark for technology change over time. But the US Census samples smartphone ownership through its American Community Survey (ACS), which segments age bands of 65+ (total population of 47.7 million), within that age 75+ (a subset population of 20 million), and within that, age 80+ (a subset population of 11.9 million). And not only is ownership of smartphones (labeled a handheld device) among older adults growing – we now know that these smartphone users have data plans. Following the 2008 Broadband Improvement Act, questions about ownership of a handheld device, different than a tablet (Question 9) and subscription to the Internet (Question 10) were added to the American Community Survey in 2013 -- the responses to these questions were last updated in 2015 based on a rolling survey across that year. This data was made available for analysis during November of 2016. The census shows that drivers of smartphone ownership are predictable. In the 65+ population overall, the most recently available Census data confirms what one might suspect. Those who are married and have higher incomes are more likely to own a smartphone. And perhaps married couples each have a smartphone – the ACS only attributes smartphone ownership to a household. Examining the population aged 65+ living in households with incomes $75K or greater, 66% of those households have a smartphone. Conversely, those in households with incomes under $30K, only 23% have smartphones. And the ACS indicates that 33% of the 75+ age range and 27% of the 80+ have a smartphone in their household. What does this mean when smartphone prices range from $400-800 (just for the phone) and the data plan can run as much as $80+ per month per phone, depending on activity? It means that the digital divide is a very wide, income-driven chasm. Keeping and using this data-consuming device following the earning years, let alone into the aged 75+ low net-worth years, may just be impossible. What’s also worrisome – the smartphone’s security is a gaping hole. 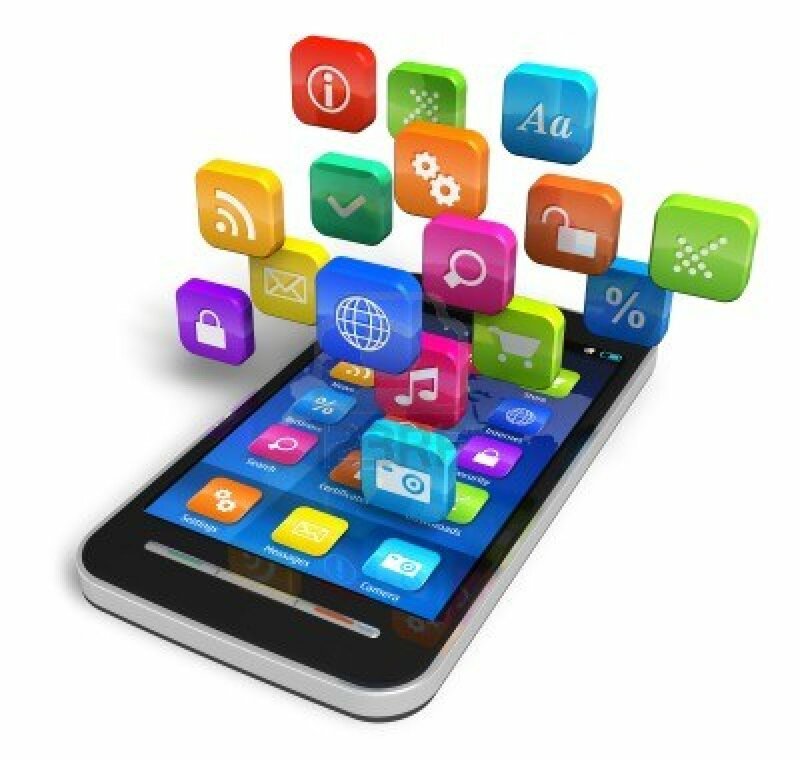 According to Pew’s latest note on smartphone security, most smartphone owners (72%) have lock screens on their phones, but "owners ages 65 and older are much less likely than adults younger than 65 to use a screen lock and regularly update their phone’s apps and operating system (13% vs. 23%)." And 8% of the smartphone users aged 65+ take no actions to secure their smartphones. Besides Pew, AARP recently surveyed technology use among older adults, actually breaking out the population aged 70+ (29%) among its responders base. AARP TeK offers video training on how to perform various tasks on a smartphone. The organization’s website has posted warnings about how to 'cyberproof’ your phone. This advice also needs to be covered in videos and in-person training sessions by AARP as we'll see this week -- at a number of American Society on Aging conference sessions. Permalink Submitted by Laurie Orlov on Thu, 03/23/2017 - 20:58. My mom doesn't use a smart phone at all due to her vision and not being comfortable with technology. She recently started using a service called Home Jeffery to schedule transportation to appointments, grocery store, etc. Permalink Submitted by Samantha Stein (not verified) on Wed, 03/29/2017 - 09:54. Thank you for pointing this out, Laurie! Security is absolutely important when it comes to smartphones, and we must all help the older population in securing themselves from potential threats. We featured your article on our monthly roundup which focuses on the different aspects of aging in place: http://www.altcp.org/monthly-digest-aging-in-place/. Hope you can drop by and share more of your thoughts! We need more people to learn about this! Permalink Submitted by Scott Grant, AT... (not verified) on Wed, 05/10/2017 - 06:52. I am glad to see that elderly and seniors are beginning to adopt technology, especially smartphones. There are som many benefits like being able to get help right away, playing mind stimulating games, and staying active socially with social media. Of course, the learning curve is there to deal with. We have tried cell phones with my grandmother but she refuses. She will look at Facebook on mine to see pictures of extended family and has learned to scroll pretty well and find what she wants to see. But she refuses to have her own device. I thought maybe a table she could see better might work. Do you have any information about tablet usage among seniors? Permalink Submitted by Laurie Orlov on Wed, 05/10/2017 - 18:25. Permalink Submitted by Cherry (not verified) on Fri, 04/20/2018 - 03:56. My grandma is very active women, she keeps searching the information online, chat with her friends through facebook, what's app and so on. The smart phones and apps bring her a more interesting and colorful life. She is happy.